L’Orchestre Métropolitain’s concert on Good Friday was not the most felicitous of occasions. First, Artistic Director Yannick Nézet-Séguin was scheduled to conduct but was convalescing at home here in Montreal after surgery in Philadelphia for a hernia. He was replaced by the Viennese Christian Arming, Music Director of the Orchestre philharmonique royal de Liège. Second, the performance of the program’s two works fell short of satisfactory. 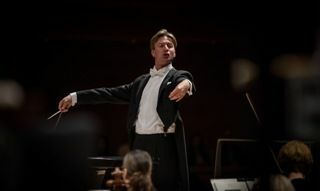 Despite Arming’s passionate conducting and his swooping gestures, his arms at times almost reaching down to the podium, particularly in the Dvorák symphony, the orchestra was not inspired. Dvorák’s Symphony No. 8 had some good moments – the cellos produced a glowing, velvety sound in the opening theme of the first movement; the strings, with a lilting portamento, brought refreshing lyricism to the waltz-like third movement; and the entire orchestra dug in to provide excitement in the climaxes of the second and fourth movements (the latter introduced by the splendid trumpet fanfare of principal Benjamin Raymond). Overall, however, the playing was not consistently tight, lacked a unifying line, and made for an underwhelming performance. Janácek’s Glagolitic Mass sounded uneven and hard-edged. The bright acoustics of the hall didn’t help. It may have succeeded better in a church with softer, rounder acoustics. The hall’s magnificent organ sounded wonderful, especially the rippling arpeggios and thunderous chords in the organ solo of Part VII. Montreal mezzo Julie Boulianne’s voice has matured and, despite her small part, brought a welcome, smoothly-controlled gravitas to the “Svet” (Sanctus) and “Agnece Bozij” (Agnus Dei). Finnish soprano Camilla Nylund sang with good intonation and assurance, including her well-positioned high notes. Bass-baritone Andrew Foster-Williams, a fellow of London’s Royal Academy of Music, sang with a robust but relaxed and pleasing sound. Canadian tenor David Pomeroy, with the longest and most difficult part, sang with searing power.